When Filmmaker Robert Lundahl began to explore Native American culture in the Mojave and Colorado Deserts in 2010, he did not realize many of the sites to which he would gain unique and unimpeded access might soon be destroyed. “I’d been interested in the Indigenous history of North America for quite some time, and my previous films had revealed ancient knowledge misunderstood by today’s society. When a colleague suggested a visit to the Blythe Intaglios, it opened up a new world of understanding of America’s Cultural Treasures, their origins and context”, says Lundahl. The Blythe Intaglios are giant Earth drawings of human forms, geometries, and pictorial representations that embody the world-view of tribal communities and cultures, which have co-evolved with and within desert ecosystems for thousands of years. The concentration of geoglyphs, petroglyphs and other human-made Earth Images, in and around Blythe, California, along the Colorado River is rich and varied. “A thousand years ago, the Colorado River Valley was lush and green, akin to the Egypt’s Valley of the Nile, or Mesopotamia’s Tigris and Euphrates. It was a sustaining ecosystem during the global warming period following the last ice age. As a result, there was and is a concentration of Indigenous peoples who make the area home, Lundahl explains. The flood plain remained productive well into the last century, before dams on the river channelized the flow and eliminated the flooding that had supported higher concentrations of birds, game and indigenous agriculture. Today’s tribal people, who still live along the Colorado River, remember. Their oral history traditions, and spiritual connection with the land remain strong today. The threat comes from the construction of large-scale industrial solar energy plants, on, around, and near sites that tribal peoples consider sacred. The Colorado River Indian Tribes (CRIT) has staunchly opposed several projects in the Riverside East solar zone. “Who Are My People?” four years in the making, explores the sites, their spiritual connections, and choices today’s society must make regarding energy production and behaviors in another, more modern era of changing climate. 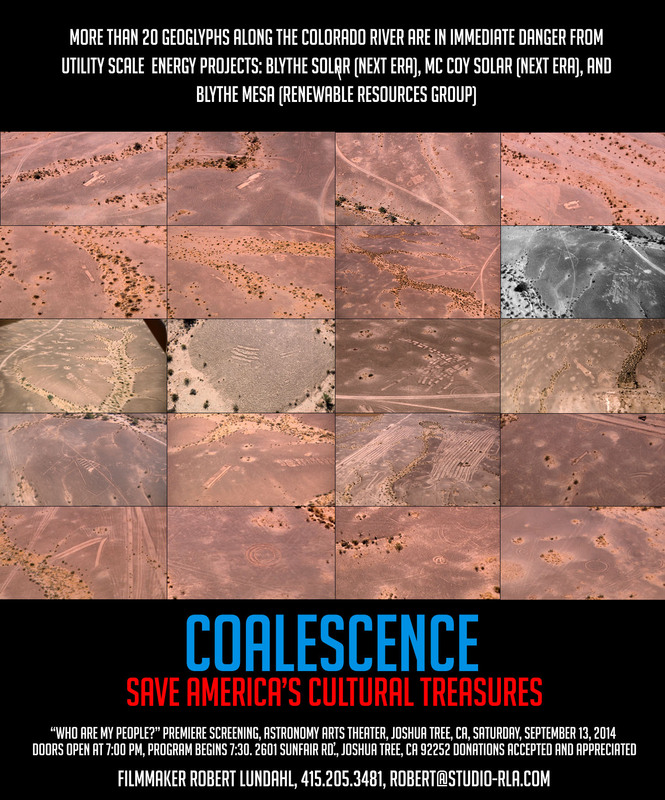 Destroying America’s Cultural Treasures is not among those choices, Lundahl insists. “Who Are My People?” premieres at the Astronomy Arts Theater, in Joshua Tree, California, near Palm Springs, in the evening — under the stars — on Saturday, September 13. Doors open at 7:00 p.m. Program begins at 7:30. There will be music, speakers, and food. The filmmaker and Indigenous elders will be present. Donations are accepted and appreciated. The Astronomy Arts Theater is located at 2601 Sunfair Rd., Joshua Tree, CA 92252. "Who Are My People?" ©2018 Filmmaker Robert Lundahl, Agence RL | A, LLC All Rights Reserved.